IT�S HARD to think of the 2009 World 14.1 Straight Pool Championship and not focus on Stephan Cohen�s amazing 133-ball comeback to take his � and his country�s � first world title. But for a moment of brilliance, it�s tough to top this shot during the round-robin stage. Facing New York�s Earl Herring, Cohen fell behind by a count of 62-3 in the race-to-100. When he finally got an opening, Cohen rolled through four racks to take a 68-62 lead. But that�s when he found himself in the tough spot shown in the diagram. 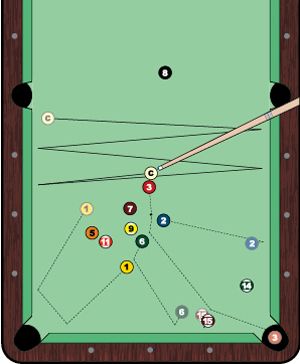 With no chance to pocket the 8, the only ball north of the cue ball, Cohen had to get creative. In no time, he drew up this little dandy, putting the 3 ball into the corner pocket in the lower right. Explaining his intentions to the ref, Cohen waved his cue around the 6, with a bit of a smirk fulling aware this was not a shot found in many instructional books on straight pool. But things didn�t exactly go according to plan. The 3 ball glanced off the 2 ball on its way to he 6. From there, it headed for the 15 ball and barely missed the point of the pocket as it found just enough oomph to fall. Meanwhile, the cue ball sprinted from one side rail to the other, eventually rolling to a stop in a spot where Cohen could keep his run alive. No doubt pumped up, he polished off the next 31 balls to go 97-and-out. An impressive triple kiss, but this shot wasn�t much in comparison to the world title that followed a few days later.